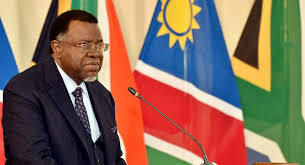 Namibian President Hage Geingob on Monday condemned a bomb attack on Zimbabwe President Emmerson Mnangagwa’s election rally, saying political violence would not be tolerated in the Southern African Development Community (SADC). The SADC is an inter-governmental organization of 16 southern African states. Geingob is currently the deputy chairperson of the bloc. Zimbabwe will hold elections on July 30. The blast in Zimbabwe’s Bulawayo City on Saturday injured at least 41 people, including senior officials accompanying Mnangagwa, who was unhurt. Geingob also condemned the attack on a June 23 public rally in Ethiopia, where Ethiopian Prime Minister Abiy Ahmed had given a speech. “The rule of law should prevail,” he said.